I promise, this connection will make sense in a second. Uncommon Goods recently reached out to me to see if I would like to review some of their products and host a giveaway here on my blog. Their site is filled with quality, fun merchandise that you aren’t likely to see other places. It’s like walking into the Anthropologie home section or the Urban Outfitters trinket section, but magnified by ten. You never know what you’ll find, but you know it will be awesome and that you’ll love it. The goods truly are uncommon, and are perfect for when you’re looking for a gift or a decoration that hasn’t been pinned a million times on Pinterest. Over half of what they sell is made by hand and a lot of it is made exclusively for them by artists across the United States. See? I promised the penguin connection would make sense. 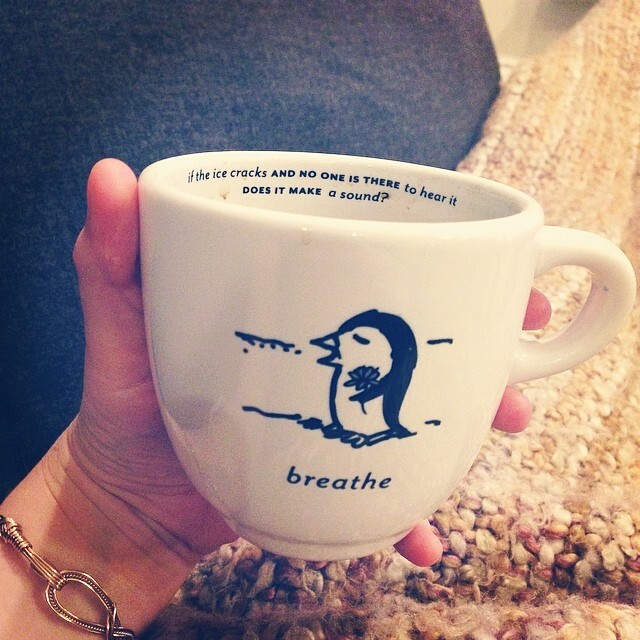 While I was browsing around their site (and falling in love with everything), I stumbled upon these “Zenguin” mugs. I love mugs, and when you go and put cute penguins on them, I’m definitely sold! Made in Tuscan, Arizona, these mugs are only available at Uncommon Goods. I’m so glad we got them! I’ve been loving drinking my morning coffee out of these mugs for the last week. The sayings are adorable, and the illustrations are just so me. I love when you find gifts that are just the right fit for a person (even if that person is yourself!). On Uncommon Goods I really feel like I can do that for all the special people in my life. 3. Leave a comment letting me know what would be a perfect, unique gift for you (1 entry). Leave a separate comment for each entry. The contest will be open until Sunday, April 13th at 9pm. I’ll announce the winner the next day (Monday, April 14th). Good luck! Disclaimer: This post is sponsored by Uncommon Goods. All thoughts and opinions are 100% my own. I like so many things on the site but the “bad dog pillows” are fun and really cute! These mugs look really cute. I’ve been on the look out for a new mug to use when I’m in my office counseling, so that’s what I would want! I like Uncommon Goods on facebook! Looking on their site, I think the “grow old with you terrarium” is super cool! I love the “The Neighbors Have Better Stuff” doormat. I have been hunting for a doormat but haven’t found one I like yet. I really love their whole site! I’ve gotten some things from them in the past. I’m going with Salts of the World Test Tube Set $40.00. The perfect gift for me would also be a fun mug, I’m getting tired of seeing the same old mugs in my cabinet! liked them on FB…i have a few people that are hard to get gifts for so YAY! My Mom loves anything with penguins so these would be perfect! I already like you on Facebook 🙂 Thanks for a great giveaway! And I liked Uncommon Goods! My son asked me what I want for Mother’s Day and I’m still at a loss, so no idea on the perfect gift. Oooo I want the Elephant Family book ends. (I got to ride on an elephant when I was a kid, so I totally understand the animal obsession). I’ve purchased several gifts from Uncommon Goods and love them! The perfect gift would be their tie dye skinny glasses to serve my juiced vegetable and fruit drinks. Their bird houses are pretty cool! I follow you on fbook. I like your page too! I love the pizza cutter bike!! It’s so perfect! I love the cooking guidelines apron because it is very cute! A perfect give for me would be a handmade piece of jewelry. The Nest Egg Necklace would be a perfect gift for me. I like Girl Gone Veggie on Facebook! I would definitely get the Donut pillow! It’s so fun. Thank you so much for this giveaway! I follow Uncommon Goods on FB as Rust Hawk. I am one of your FB followers as Rust Hawk. My garden would surely love this Recycled Milk Glass Hummingbird Feeder! I really like the Bora Scarf in Green! I like Girl Gone Veggie on Facebook. I like the robin’s egg soaps in apothecary jar! I love the face mug. I like the flower birthstone necklaces! Liked the FB page – Uncommon Goods. Ive always wanted a lazy susan so this granite one is perfect! Liked Girl Gone Veggie :)! Okay I have to say… I HAVE A PENGUIN OBSESSION TOO!! A perfect, unique gift for me would be going to the aviary here for a penguin feeding!! I think the Granite Cheese Board With Spreader would be a wonderful gift! I liked Girl Gone Veggie on Facebook. I think the solar light garden stake- flower globes are cool. Liked uncommon goods on FB! I would love a unique pillow! Uncommon Goods has some really cute Austin, Texas pillows I’d love to have on my sofa! I liked your page and the uncommon goods page. Also I agree penguins rock!!! I liked the facebook page Girl Gone Veggie under Jen Winiger. I liked the page Uncommon Goods under Jen Winger. And any one of those mugs would be the perfect gift for me! I’m a little bit off the wall! Oops, sorry! Just realized the contest was over. boo!